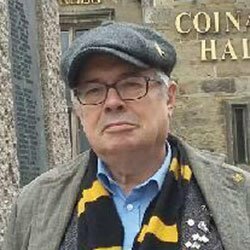 Tim Saunders is a Cornish language poet who also writes poetry and journalism in the Welsh, Irish, Breton and Cornish languages. He is resident in Cardiff but is of Cornish descent. He is a bard of the Gorseth Kernow, a literary historian and editor of ‘The Wheel’ – an anthology of modern poetry in Cornish 1850–1980.